Because of the damage that can be caused by improperly fitted cordeos and the growing popularity of cordeo riding I feel this small article was necessary. There are a few videos, which have reaches high degree of popularity showing improper use of cordeos and misleading beginners into thinking that the cordeo should be fitted high up the horse neck. 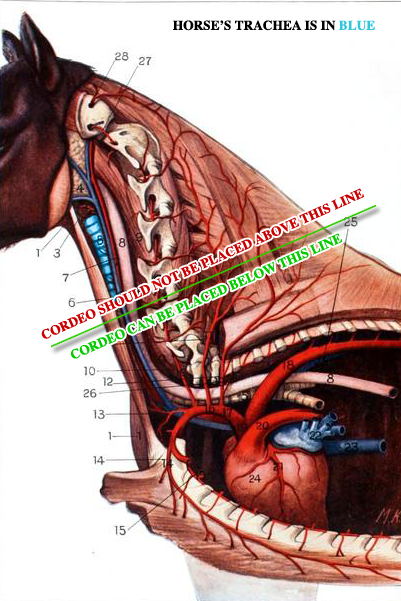 The diagram below shows where the cordeo can be placed and where it should not be placed. The part colored in light blue is called the trachea. It is a long wide tube occupying the middle line of the neck, and separated from the spine by the oesophagus. It is part of the respiratory systhem and it extends from the cricoid cartillage of the larynx to about the fourth dorsal vertebra. It is about 3 feet in length and 2 inches in width. The pressure applied on the trachea can (depending on degree of pressure and how high the cordeo is fitted) bring discomfort or pain, or make the breathing process difficult if the horse is asked to perform difficult exercises during a long period of time. This is obviously not the aim of cordeo riding. Cordeo riding is designed to be the most painless riding alternative not causing discomfort or pain, lets keep it that way by keeping the cordeos low and our hands soft.